Those forces all share the pursuit of « scapegoat » of the unquestionable difficulties of such a large part of the people: the migrants. The migrant, who is the preferred target of the right-wing radical forces, is not the only target. Discriminations against any real or alleged diversity, the Roma and Sinti, homosexuals, women, Jews, political opponents are also taking place more and more often. The everyday more explicit attack to the achievements of women also deserves a special attention. Ethnicity, gender, language, religion, political views, personal and social conditions have now become the new frontier of a creeping racism that poisons the social cohesion and identify « the Other » as « the enemy ». The « heroes » of the neo-fascist Forza Nuova tried to attack the empty organization’s office with posters and Bengali fires this weekend. Die FIR, die Dachorganisation von Verbänden ehemaliger Veteranen, Partisanen, Deportierten und Verfolgten sowie Antifaschisten heutiger generationen ist tief empört über den neofaschistischen Angriff gegen die traditionsreiche italienische Veteranenorganisation ANPI. Mit Plakaten und bengalischen Feuern versuchten die « Helden » der neofaschistischen Forza Nuova das Büro der Organisation am Wochenende zu attakieren. 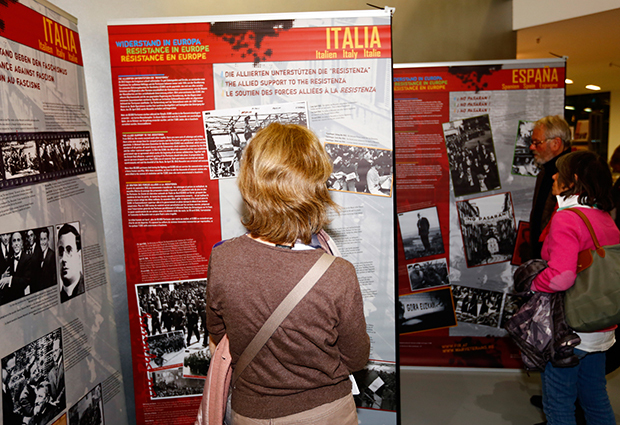 In recent years, we have often had to experience painfully that the present policy and development of the European Union does not correspond to the interests of large parts of the people in the European countries. In particular, the response to refugee situation and the fiscal clout of several states have deepened the social divide in Europe. Numerous decisions lead to massive social exclusion and dismantling of workers’ rights, at the expense of the weakest in the respective countries. At the same time, the tendencies to foreclosure of the « fortress Europe » are massive reinforced and the development of a European military power for international missions is promoted. On 13 October 2018, several hundred thousand people demonstrated against racism, exclusion, « Fortress Europe » and intolerance at several demonstrations in Berlin, Bavaria and Hesse. Under the motto « indivisible – solidarity instead of exclusion », 240,000 people marched in Berlin. Many people had banners, posters and balloons with them. Among other things, « No to agitation against Muslims » and « Racism is no alternative » were read. A huge banner bore the inscription « Solidarity with the victims of right-wing, racist and anti-Semitic violence ». Also in Hesse thousands of people took to the streets against racism, discrimination and the AfD. The largest demonstration took place in Frankfurt. Under the motto « We are more », the association « Lautstark gegen Rechts » called for an alliance of around 40 initiatives, parties and trade unions. Solidarity with refugees and rejection of deportations to crisis areas were also topics of the demonstration. According to the alliance « Keine AfD in den Landtag » (No AfD in the state parliament), there were actions against the AfD’s entry into the Wiesbaden state parliament on Saturday in several Hessian cities, including Baunatal (Kassel), Darmstadt and Gießen. 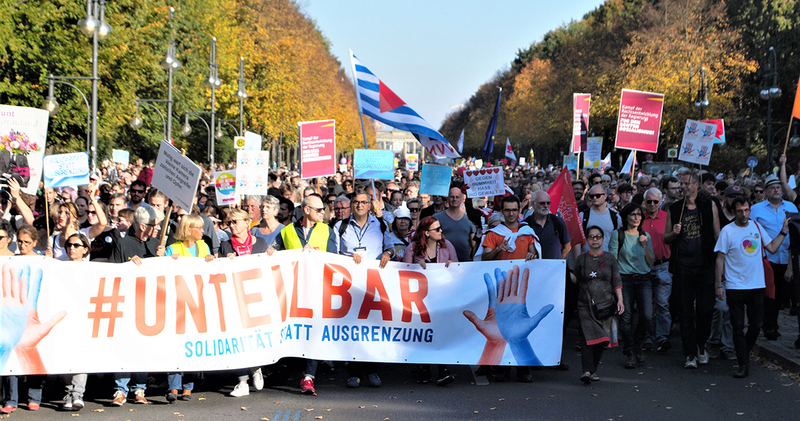 Unter dem Motto „unteilbar – Solidarität statt Ausgrenzung“ marschierten allein in Berlin 240.000 Menschen. Viele Menschen hatten Transparente, Plakate und Luftballons dabei. Unter anderem war zu lesen « Nein zur Hetze gegen Muslime » und « Rassismus ist keine Alternative ». Ein riesiges Transparent trug die Aufschrift « Solidarität mit den Opfern rechter, rassistischer und antisemitischer Gewalt ». Auch in Hessen sind tausende Menschen gegen Rassismus, Diskriminierung und die AfD auf die Straße gegangen. In Frankfurt fand die größte Demonstration statt. Unter dem Motto « Wir sind mehr » hatte der Verein „Lautstark gegen Rechts“ mit einem Bündnis von rund 40 Initiativen, Parteien und Gewerkschaften aufgerufen. Auch Solidarität mit Flüchtlingen und Ablehnung von Abschiebungen in Krisengebiete waren Themen der Demonstration. Aktionen gegen einen Einzug der AfD in den Wiesbadener Landtag gab es am Samstag nach Angaben des Bündnisses « Keine AfD in den Landtag » in mehreren hessischen Städten, darunter in Baunatal (Kassel), Darmstadt und Gießen.